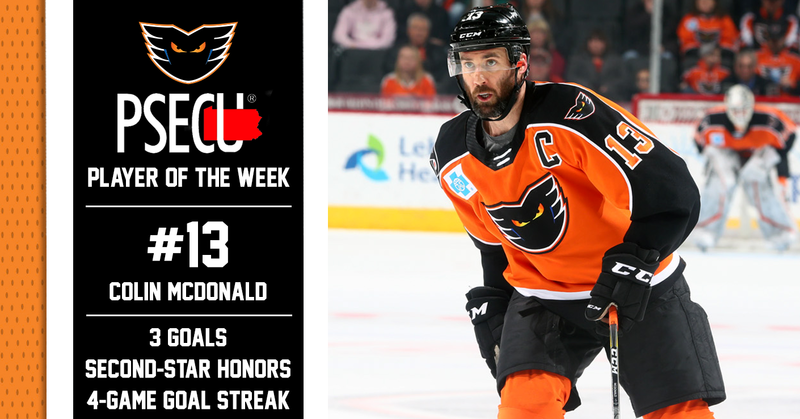 Lehigh Valley, Pa. — With three goals in three games this past week, as well as riding a four-game goal streak, Lehigh Valley Phantoms forward Colin McDonald has been named the PSECU Player of the Week. The Lehigh Valley Phantoms kicked off the final week of the 2018-19 season with a Tuesday night contest against the rival Hershey Bears in Chocolatetown. After a scoreless first period, the Phantoms potted two goals in the second, the second of which came off the stick of McDonald. Philippe Myers skated the puck down the center of the ice and then dished a backhand pass over the stick of a defender to McDonald who ripped the puck over the glove hand of Hershey goaltender Vitek Vanecek. 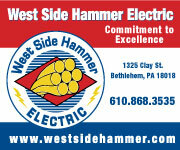 The Phantoms went on to defeat the Bears in overtime by a score of 3-2. 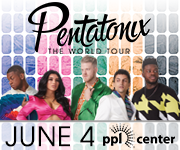 On Friday, Lehigh Valley traveled to Providence for its last road game of the 2018-19 regular season. McDonald opened up the scoring for the Phantoms at the 5:18 mark of the first period as he was the benefactor of a Matthew Strome centering feed from behind the net. McDonald fired home his 12th goal of the season to extend his goal streak to three games. Despite a feverish comeback by the Bruins, the Phantoms hung on to top their Atlantic Division foes by a score of 4-3. 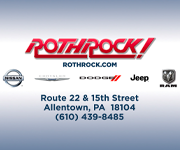 In the Phantoms regular-season finale against the Hartford Wolf Pack on Saturday, Lehigh Valley found themselves down 2-0. McDonald started the Orange and Black’s comeback late in the second period as he fought through a defender to a rebound and shoveled it into the net on the backhand for his 13th goal of the season. McDonald’s third goal of the week saw his goal-scoring streak reach four games and his point total for the season hit 28 (13G-15A). His efforts also earned him second-star honors on the night. 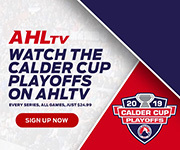 Lehigh Valley went on to defeat Hartford 3-2 in a shootout, capping the 2018-19 season off with a victory that stretched the team’s current winning streak to five games. Over four seasons as the captain of the Phantoms, McDonald has amassed 60 goals and 69 assists for a total of 129 points across 248 contests. 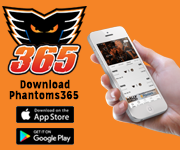 Season tickets offering a wide range of benefits as well as 21-Game and 13-Game plans are available by calling the Phantoms at 610-224-GOAL (4625).